It looks like the photos I put on the Wiki page showing the right way to connect the uIDE to a PCW are not consistent with the cards I sent out. This is because I used a prototype in the photos. So, I have taken those shots down temporarily, and will put some new ones up soon, when I have a built uIDE-8 to show. Big thanks to GeoffB17 for pointing this out to me! sure, I will describe my experiences with the uIDE:i am using a normal 40pin cable for PC hard drives, as you see at the picture.First I had connect the uIDE at the other connection of the cable, but that doesn't work, I think because of the cable length. The cable should be short I think, about 15cm. Meanwhile I use J29CPM, the file transmission I have changier from EMT to EMS. This version of CPM can be started from my GOTEK-USB with HxC firmware and the hardware driver works. In order for the new drives to be detected, they must first be addressed once. The uIDE Drive is really fast, like the RAM. With xformat new DOMs can be formatted very quickly and comfortably. It is really a great work, I hope SymbOS will support the uIDE soon. Got my uIDE working just now, after some problems due to the instructions being a bit out of date, and I'd got a couple of the utilities from an early version. Thanks to Jon for 'telephone support', but all working fine now. Just need to sort through all the 'stuff' on the DOM, a lot I already have. Still, not exactly short of space now! I'll do some testing regarding compiles, etc, and report further. Seems like the version of NSWP I have is OK with the drive capacities, but I need to keep an eye on that. Maybe some file sizes cause confusion, or so I've noticed on the Joyce emulator. By the way, my IDE cable is fairly long, maybe 40cm+, but it seems to be fine. If it's working, I'll not mess with it. Thanks Marcus! Yes, Prodatron (author of SymbOS) already said he would support uIDE on the PCW under SymbOS (also on the 6128 I imagine, but he wants to do the PCW version first). I am waiting for some parts before completing his boards. I like your GoTek installation, by the way. Looks really tidy! About the cable length. I have made up 50cm cables that worked OK with expansion port adapters. But as your installation is with a shim, I imagine it will be internal, so you can stick to short lengths. In general though, I agree that it's wise to minimise the cable length, as there's no termination (or buffering) on the board. Maybe your cable has some poor connection on the outer socket? I found that the old IDE cables I have lying around are quite stiff due to age, and this may cause their sockets to work loose. Try clamping the suspect socket in a vise to tighten the connections. Geoff, I'm glad your boards are working now. 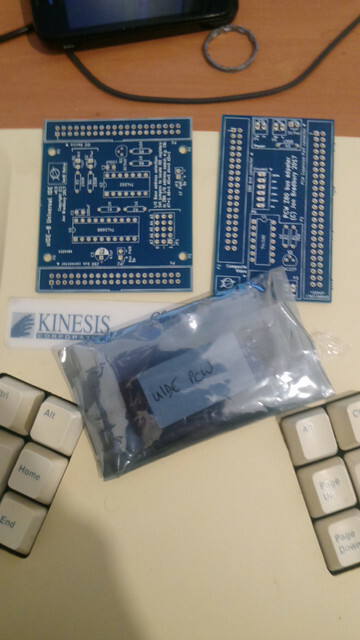 I have updated the photos on the Wiki page that caused the confusion, although they show uIDE-16s connected to the PCWs because I have no built uIDE-8s to hand that are not prototypes. Not to worry though; the uIDE / bus cable orientation is now shown per the uIDE-8 "production" boards. I like your GoTek installation, by the way. Looks really tidy! Thanks, I attach the stl-File from my blende for 3D printing. sucram, I am a little concerned that the XFORMAT.COM program is corrupting the usage string. Is this because your PCW is German? Also, you might notice that it shows 16 devices (partitions). It's supposed to give you 16 IDE partitions, but the PCW only allows 6 and moreover, it takes one away from you if you plug the CPS8256 serial adapter in. To add insult to injury (as we say in the UK), LocoScript gives you C: D: E: F: G: H: I: J: K: L: (but stops there). Odd, no? Nice gotek installation i don't have a 3d printer but love to get one for this kind of parts. Yes, the strange display with Ä and Ü instead of [ and ] is because of the German language, the character table is a little different. Anyway, I thought I'd post a few pics for all to see. I just need to sort out drivers that'll work with this machine and then make it boot from the uIDE8. SURVEY and IOMAP look like useful utilities. Could you upload a copy of each somewhere, please? Copy of IOMAP and SURVEY utilities. With source, I see... nice! I'm a little late to the party, I'm interested in doing this. What are my options? bare boards? kit? or source my own PCBs? Start by reading the wiki page I wrote. It should answer your questions and explains the capabilities and limitations of the device. At the moment I have boards but not enough components to build finished items (I'm short of the edge connectors used by the adapter). If you want to use a Z80 shim I can probably build a set, because it doesn't use the edge connector. I strongly recommend you buy a DOM (£4) as well, because it has the driver on it, although you can download an image and put it on another IDE device. PM me when/if you are ready to proceed. I have now run out of the v0.5 "blue" uIDE-8 boards. All I have left are the v0.4 "red" boards, and these have a couple of manufacturing defects which are easy to correct. These minor issues aside, they work exactly the same as the blue boards. Instead of the Edge connector. And an Appropriate short cable from the PCW. They are only wire connections after all. It's a tricky job, removing a 40 way connector though, unless you have a desoldering station. But how will you connect it to your PCW, if not via the edge connector? An alternative might be to get a Z80 shim. Open up your PCW and see if the Z80 is socketed. If it is, you are in business. PS, I see you are not using the video circuit (missing trimmer pot). None of the components in the video circuit border are needed by the interface. But make sure you have the uIDE oriented correctly. Hopefully Jon will reply, but the bits you show look like the same one I have, the larger card is for the DOM etc, the smaller one fits onto the interface connector. The second one is NOT the card for the Z80 shim thing. Have you been sent the wrong bits? Check the Wiki page for pics of the various bits/alternatives. I'm very happy your boards turned up! i see this go in the edge connector , where you got edge connector this size ? Page created in 0.308 seconds with 105 queries.